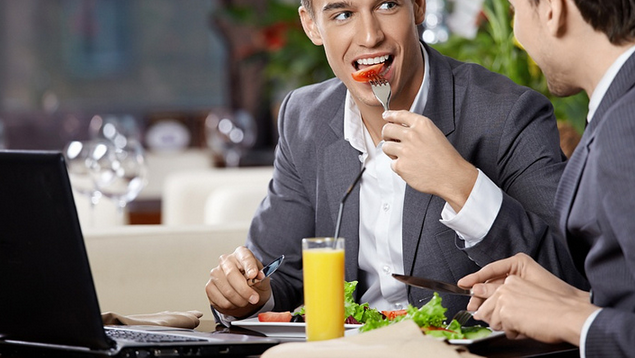 Keep these dining etiquette tips in mind when having business lunch with partners or customers. When you’re invited to a casual business lunch, anticipate that it will be anything but casual. Your behavior is on display just as if you are in a business meeting. Any error you make can become a permanent stain on your professional record. That’s why it’s important to keep these dining etiquette tips in mind in order to stay in top favor with your business associates and potential clients. If you receive an invitation to a business meal, it’s courteous to respond promptly. If you wait longer than one week, it might look like you’re holding out for a more attractive option. If you respond but don’t show up at all, you most likely won’t be invited again. Always follow through, keep your word and be on time. 2. Place your napkin in your lap. To indicate good manners right off the bat, open your napkin and place it on your lap when you sit down. Never tuck it into your shirt or use it as a handkerchief. If you have to excuse yourself and visit the restroom or make a phone call, place it on your chair. At the end of the meal, place it neatly on the table, to the left of your plate. Don't belly up to the trough just because you're dining on an expense account. Order a simple lunch that you can gracefully eat in the allotted lunch hour. You’ll be seen as confident and in charge when you choose reasonably. Stay away from messy and difficult-to-eat foods including ribs, lobster, corn-on-the-cob, oversized sandwiches and pasta with a red sauce. 4. Don’t talk with your mouth full. This one harkens back to the childhood basic training: take a small bite, chew, swallow and then talk. If you must say something, cover your mouth with your hand, or gesture with a “wait a moment” finger and then talk once you’ve swallowed. 5. Try it, you might like it. There may be times when you’re served an unfamiliar dish. Try it. You may be surprised to find that you like it. You run the risk of offending your host if, when traveling internationally, you won’t try something new. If you have any dietary restrictions or food allergies, let your host know ahead of time. Eat what you can and leave the rest. 6. Remember the 'BMW' rule. Have you ever eaten someone’s bread by mistake? To avoid this awkward situation in the future, remember that B: Bread is always in the left, M: Meal is always in the middle, and W: water is always on the right. 7. Leave your plates in place. Never stack your dishes when you’re finished eating. Leave them in place and place your knife and fork side by side, on a slant across the center of the plate, in the 10:20 o’clock position. This is a silent signal that indicates that you are finished. 8. Treat the staff well. You can tell a lot about a person by the way he or she treats a service person. Be sure to treat the wait staff respectfully and thoughtfully. Say “thank you” when service is rendered. How you treat everyone in a restaurant goes farther than just table talk. Be the gracious host or the stellar guest by remembering these social graces and you’ll get you through a dining engagement without winding up with egg on your face.